MODI Group is leading manufacturer of CPVC Pipes and Fittings in INDIA. 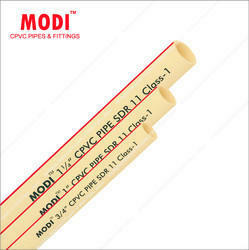 ‘MODI’ CPVC Pipes are manufactured on Imported Conical Twin-Screw Extruder machines using Virgin Grade CPVC material imported from reputed suppliers. ‘MODI’ CPVC Plumbing System is ideal for Hot & Cold Water applications. CPVC Pipes are available in SDR-11 & SDR-13.5 conforming to IS:15778.